After getting the Accuquilt Go! cutter I realized that cutting shapes with it is WAAAY easier than using templates. And it is nigh impossible to cut precise curved shapes with the rotary cutter. (yes it is possible, but you can wreck a blade quickly! don't ask me how I know...sigh!) I was looking at the available dies for the cutter and saw the Drunkard's path die. 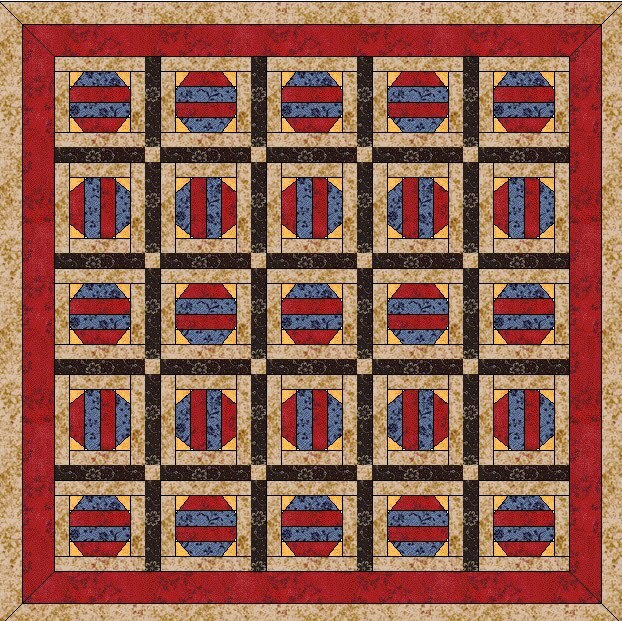 I have seen quilts with some lovely layouts using it -and it makes CIRCLES with one layout. Ooooh.... I like circles but don't like doing applique too much. --b. I don't like the time consuming part of sewing around applique. So, I was emailing with a friend and said "I would like to get the Drunkard's path die, but I am not sure about sewing those curves AND I am hesitant to spend the money." Guess what?!?! She has the die and had some cut. Now this is one sweet, kind, supportive, creative lady I am talking about. If you haven't been to her blog , you should go.It is - A Creative Life (one stitch at a time) The lovely and talented lady is Royce. Royce offered to send me some cut pieces so I could try it first. (Thanks for your generosity my friend.) Today I got them in the mail. She even included a finished unit so I could see how it works. She clearly pinned hers and was very precise. I decided to sew mine without pinning. Honestly it did not come out too badly. I did notice that of the three fabrics in it, one of them (the cream color) stretched more than the other two and threw me off a bit. I am sure you can see that my pieces don't all match perfectly, but it isn't too bad. Truth? I don't like sewing the curved seams. I am glad to have found out before I bought the die to cut them. However, I will use this piece for something. I will probably stick it into a donation quilt and quilt a bit extra to disguise the mistakes. 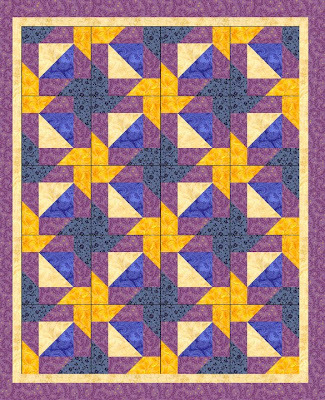 Oh yes, the patterns I posted yesterday with the chisels and triangles - I can't figure out how to make the block without a LOT of y-seams. Back to the drawing board (on EQ that is.) Y'all have a great day and make something creative. First is "Chiseled in Fabric"
I am thinking Accuquilt should hire me to make patterns for them. What do you think? And a faster, brighter one. 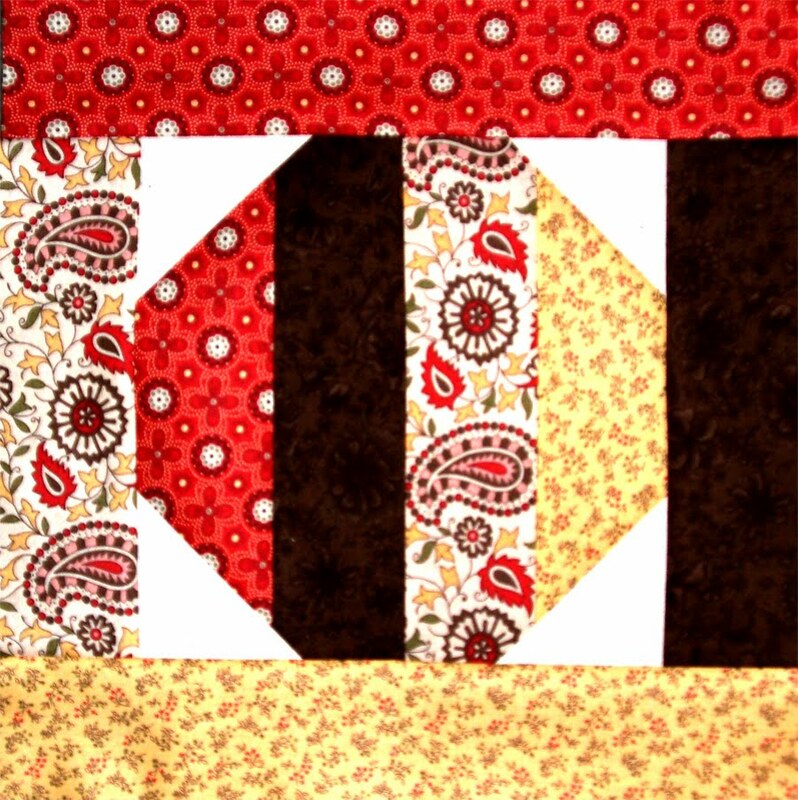 After making Block nine of the Jelly Roll Quilt Along, I thought about it a bit. 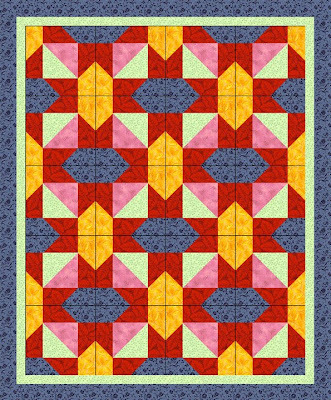 I think it would be a great block to make an entire quilt from. Yeah, I think the wider black border really makes it pop. My tumbler quilt top is finished. 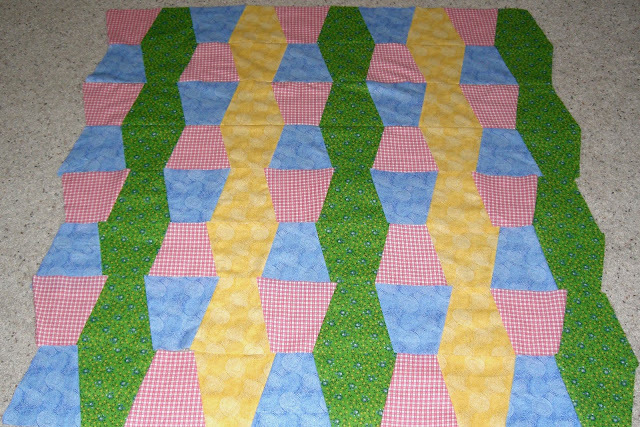 I took the picture before I trimmed the edges, but now it is ready for layering and quilting. WOW Fast! Those quarter inch seams were much better than I thought. Most of it matched up really well at the seams. I suppose it just looked off in the picture before it was joined. Yaay! This was less than 48 hours in the making from the first cut of the fabric to trimming the edges. I started on Thursday night cutting the fabrics. The Go die arrived on Thursday so I had it when I got home from work. I had to do my chores first but then I got on EQ and did the layout. Then I picked the fabrics and started cutting. I did iron the fabric first, as I find that makes for better cuts and better sewing. 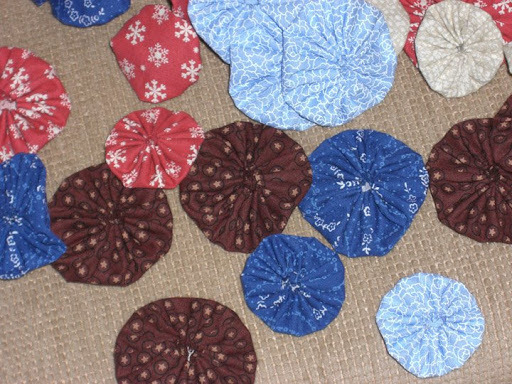 I cut a number of shapes and sewed four rows. (I did not join them yet) That gave me an idea how many more cut shapes I needed to get the size I wanted. So I cut more...too many more - I have leftovers! I am thinking a matching pillow or maybe a table runner. Friday night, after work I sewed a couple more rows after doing the "have to's" and going out to dinner. On Saturday, I sewed some in the morning but we had a get together for lunch...so that was some interruption. We stopped at the hardware store for some poison ivy and brush weed killer I needed, then back home where I sewed and joined the final rows and had this picture taken. After a rest, I trimmed the edges. It is now folded and patiently waiting for batting, backing and finishing. With all the different things I had to fit in the Tumbler top was done in less than two days. Suppose I had cut this from a template??? yeah, I would still be cutting - or maybe I would have given up! I love my Go! 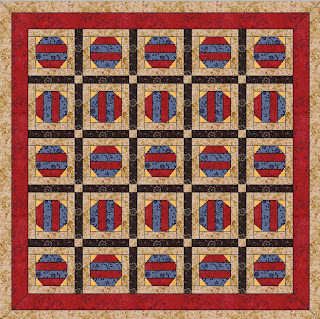 If you are on a limited time basis with your quilting, it can really speed things up. The tumbler quilt it coming along. I made a mistake Artistic Design Choice and changed the layout. I think I like this a lot better. What do YOU think? Only four rows are joined. The others are just laying there. I must say that my quarter inch seams need to be more exact. Yikes, now I can't blame the cutting. The AccuQuilt Go! cutter cuts the perfectly with no dog-ears to trim away. Wait, I know, the fabric stretched! Yeah, that's it. heeee heee. 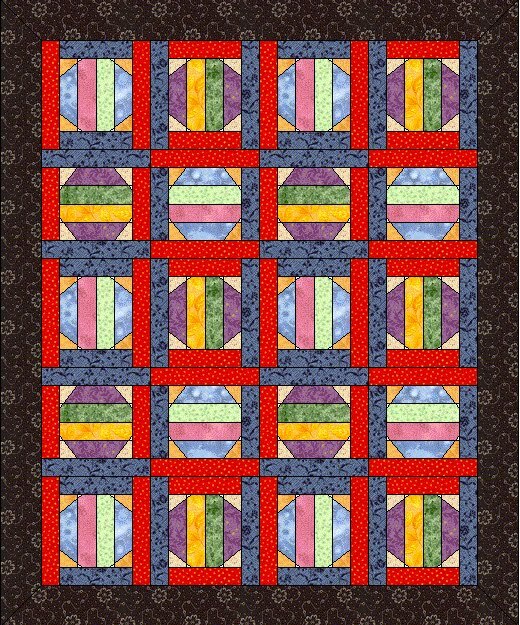 Several people asked how I did the Tumblers in Electric Quilt. Remember mine is version FIVE so if you have a newer one it may be different. I had a heck of a time finding the Tumbler on EQ5. Thank Goodness for HELP. First Click on QUILT -> then -> NEW QUILT->then -> ONE PATCH QUILT ---- then mine gives a hexagon. ARRRGH...but here is the secret. Click on the layout tab at the bottom. Then in the little window click the drop down on Patch Style...scroll down till you see Tumblers. Adjust the layout for number of rows and columns and have at it. I got a couple of packages in the mail today. One of them I have been itching to try. 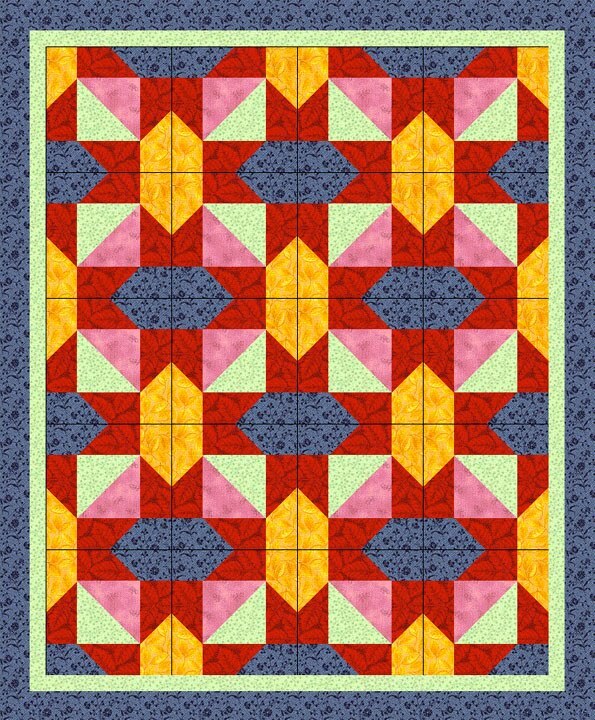 I did a layout in Electric Quilt (5) so I could get an idea. Oh, you want to know what I got? I got a Tumbler die for my AccuQuilt Go cutter. Then here is a picture of some of the blocks I cut and sewed into rows. The rows aren't joined yet. I still need to make a few more first. I want to have all the rows complete before I start joining. Of course the layout was solids and I used prints.But I think they "read" as solids. Hey, it works! Maybe it isn't the prettiest girl in the class..but it only cost me a few minutes with the pliers and stapler. Are ya happy now Barb???? Today after work I stopped by Mom and Dad's for a visit. I like to check on them pretty regularly and be sure they are doing okay. We were sitting on the front porch after a light rain had cooled down the unseasonably hot temperature. For most of my life there have been these two flower bushes in the yard. They grow side by side and even are intertwined a bit. They are now about ten feet tall. Dad calls the flowers "hollyhocks" but they aren't. I don't know what they are though, so if you know tell me. One bush has white flowers and the other has purple/lavender ones. Last night I was watching a movie, but I don't like to veg and watch a movie. So I cut some Half Square triangles with my Go! cutter. These make a 2.5 inch square. That finishes to 2 inches. I cut a bunch of them from little scraps. (Oh this is the die that comes with the cutter. It cuts these, plus 2.5 inch squares and a 4.5 inch square.) So after I made a pile of them -and also sewed some strips together for the rail fence blocks, the movie was over. I took my pile to the ironing board and pressed them. Then I could NOT resist playing with layouts. I got this block which I think is SWEET! Mind you , it is not sewn together. I just put the pieces in this orientation and took a picture. The seams SHOULD be straighter and the points SHOULD line up once I sew it. 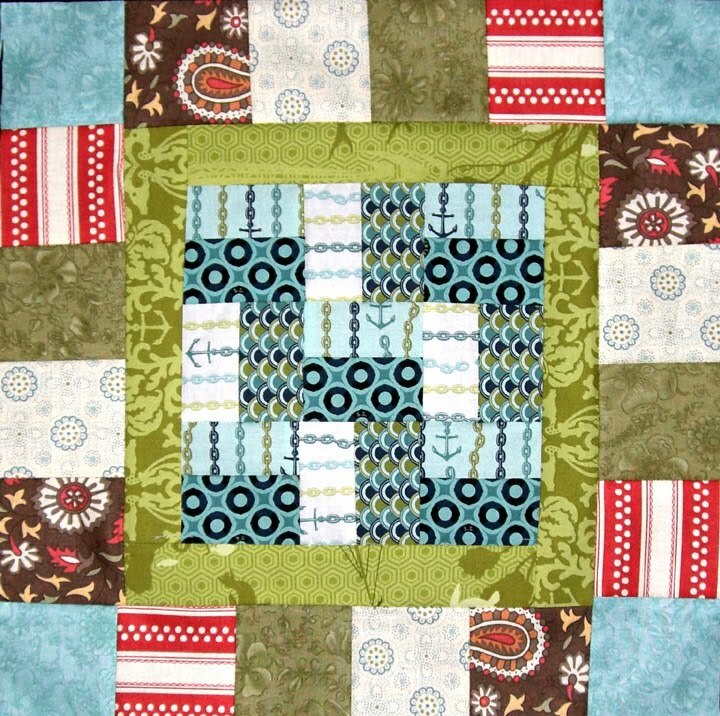 And to think, I had not considered the Half Square triangle cutter(s) until Pat mentioned that she was salvaging her scraps with it. Yaay! Thanks Pat! Blocks and Soap and Fabric and Painting! What do all of those have in common? Well mostly that is what I am posting pictures of today. Ha ha. I have been making these rail fence blocks from strips I cut with the Go! cutter. 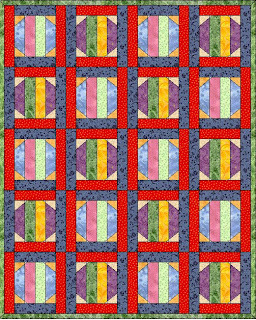 (singing) "Red and yellow, green and tan, working on a master plan, Oh, I'm loving sewing these strip blocks"
I am trying to come up with a layout for it. They are so easy to do with the strips. Just sew two strips together, then the other two and join in the middle. Square up the end and cut into blocks - these are all 8 1/2" squares. I have 22 of them so far. I won this from Old Red Barn Co. Mmmmmmmm it smells so GOOOD!!!!! It is Bulgarian Lavendar goat milk soap. My skin will love this! This is a good sized bar too. Oh yeah, she sells this stuff too! Maybe you would like some for yourself, I am not sharing mine! I couldn't resist! It was such a deal. 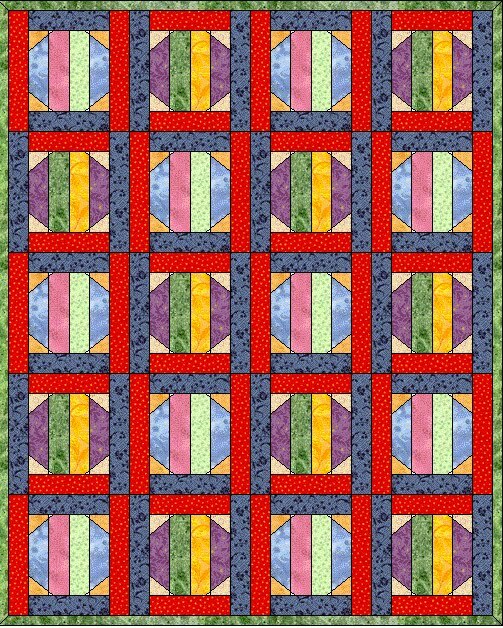 !00% cotton quilt weight fabric. There is a yard of the two on the left. The light blue floral-y one? Almost four yards!!! Could you have resisted? I mean I need lots of practice using that Go cutter, right? One of my abstracts using a layering technique. Some of the light, almost floating, "designs" you see are from stamps I have carved. I love using my own stamps in the work because it makes it more "mine" than using purchased stamps for texture. 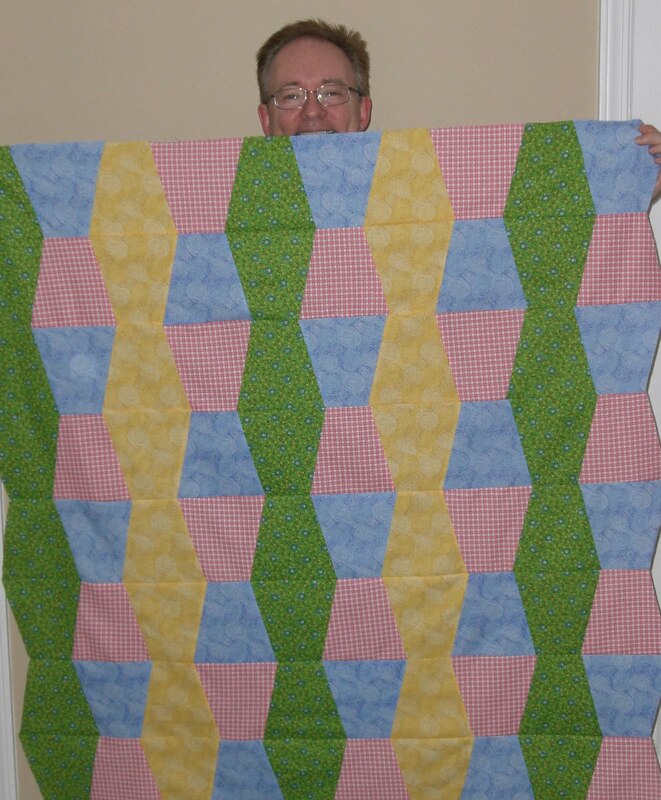 I have had parts of this quilt done for some time. I had gotten "tired of it" and wanted to work on some other things. Today, I pieced the top and bottom borders which I am NOT showing yet. However, here is the first two rows that are now joined. This quilt is meant to be wonky, so don't fret about the crooked edges or other curious things. When it is finished it will look great, and, more importantly, be loved! 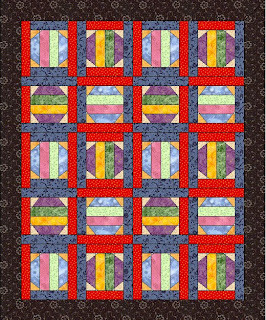 Over at Quilts by Lee there is a giveaway. She is giving away a yard of fabric from her eBay or Etsy store. Go enter and PLEASE tell her that I sent you. If you don't want the prize, just go say "Gene Black sent me"
oh my...lots to lust after on the eBay store....so tempting! Remember when I was doing these? Today I am sitting in the hospital waiting room for outpatient procedures - I am the transport driver today for family. So I am joining a few more of them. I need to measure the unsewn circles and see if there is a die in that size for the Go cutter. I thinK it will a take a few thousand more before I finish this quilt. This is long term handwork project. Update:corrected mistyped words (I hope) and still at hospital- tired of hand sewing. I believe I told someone the only UFOs I have are the two quilts I am avoiding working on. I was w-r-o-n-g! The table runner used strips from that same honey bun. I guess that prompted the pieced top to appear. Who knows? I will just say "serendipity!" 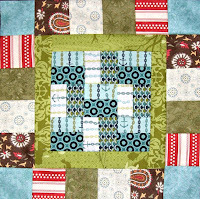 By the way, Barb posted a TUTORIAL for piecing this if you want to make one of your very own. So I cut a piece for the back and the batting and sat down and sewed. I didn't want to do a binding, so I sewed it "escape hatch" style and turned it and used topstitching to close the open edge and also finish all the edges. Here it is draped over the back of my recliner. It looks pretty nice there, don't ya think? But the problem with a leather recliner is nothing stays there. it just slips and slides off. I think if the top was just too busy with something else on the table, it could be flipped to the simple green fabric for a more "plain" look. I haven't quilted it yet. I am debating just how or IF I will do it. So that is what I did today. I am not mentioning the "other" cutting I did. I have been accused of rubbing it in about that cutter. ( by Pat and Nancy) heheheheee How is that for "not" mentioning it? And - I finally figured out what that blogger background image problem I had. Would you believe it was a "gadget" that put the background image on the page? It was, and it is gone now! Edit: All the grief I am catching about my "ironing room" Sheeesh, I have the ironing board in a bedroom that functions as storage, music room (my little keyboard is there) junk room, and yes, ironing room. I wish I had lots of space but I just have to make do. Trust me, it is nothing grand! PS...I would bet Nancy has all her fabric folded on little mini bolts and on shelves in a closet. You may notice that my blogger layout has changed. I was very careful and saved the template before I edited it. That should make everything fine because I can upload the old one and set it back, right? Sure EXCEPT- I was going to remove the background image (multi-color pastel blur) Well, I can NOT figure out how I put it there. I can't find a reference to it in the code. I know I hosted the image on my Flickr stream. Ah, just go and delete it, right? Wrong! that left a "missing image" block from Flickr. Very Bad! So now I have a new look. This is a mini quilt I made using fabric cut with my AccuQuilt Go! cutter. I used Stars, Five inch Squares and Two and a half inch strips. First I cut out the blue squares, then the yellow stars which were backed with fusible. I ironed the stars onto the blue squares and then I used various stitches on my machine to sew them down in a funky raw edge applique style. Next I cut the red Five inch Squares and the Two and a half inch strips. The assembly was so easy. I will say that I noticed that the stitches around the stars slightly "shrank" my blue squares. So be aware of that if you try this. The cutting was much easier thanks to my Accuquilt Go! cutter. Man, I need that tumbler die!!! It is on my "wish" list. I got a call that my big package had arrived. So I took off work a bit early. Actually two packages had arrived. One of them I had already tracked and knew it was at my door. But for the GO! cutter I didn't have tracking info. So I had someone watching and waiting to call me when a box arrived with the word ACCUQUILT on the side. Inside this box was THIS Box! The other box I didn't take photos of. Inside it were some extra dies I had ordered - because I am impatient! The dies are the Star cutter, 2 1/2 inch strip cutter and 5 inch square cutter. I cut some squares, then I ironed some fusible on the back of a contrasting fabric and cut some stars. All I need to do is sew around the edges and these are ready to piece into something! How fun is that???? I am thinking red strips around the blocks for a Fourth of July table runner. Does that sound good to you? I have not used the strip cutter yet..but I will soon enough. Now, I have to tell on myself. I boo booed. Oh, yes I do make mistakes. But you see I don't care if you laugh at me, because I am laughing too. And I want you to learn from my mistakes. I used MistyFuse as the fusible. (no I did NOT iron it to my iron!) I used the teflon sheet to fuse so I could just peel it off and be ready to cut. But I fan folded the fabric. Oooops. The pressure from running the fusible to fusible through the Go! caused it to meld together. Not gonna do that again. Luckily I still had some fabric with MistyFuse on it. So I took some wax paper and layered it with the fabric. That put the fusible to an relatively non-stick surface. I rolled it through and lifted the mat. Lovely stars with wax paper backings. Did I goof again?!??!?!? Ha nope, it peeled off easily. Lesson learned. And you see the results above. 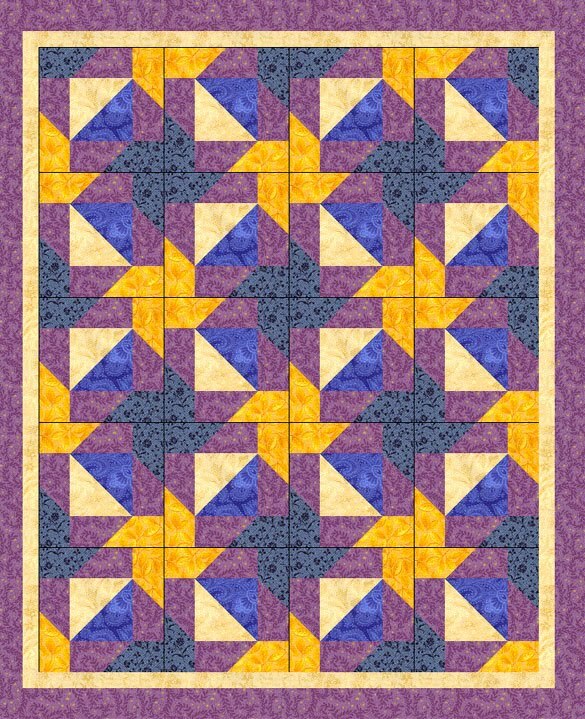 The largest star will fit on a 5 inch square but I am wondering if I will catch the points in the seam allowances. The two smaller stars go perfectly on he 5 inch square and the smallest would work on the 4 1/2 inch that comes with the Go! Okay. So now I am thinking I need hearts and circles and...ALL the other dies they make for the Go! And after seeing what Barb has done with the tumbler die, I really want it too. Oh yeah, and the tumbler quilt on the box just feeds that desire. First day, first use rating of the Accuquilt Go! ---Two thumbs WAAAAAY Up! The threads are intricately woven into a quilt called life. This post has a "deep philosophical" title. Some days I think that the interweaving of lives that we share through our blogs is truly amazing. 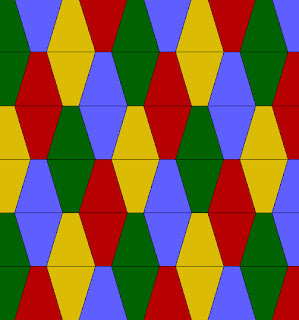 Have you ever looked at a quilt and wondered where it was made? Who made it? Did they have a huge studio? Or did they perhaps only have a few square feet dedicated to quilting? Okay....I am bursting to tell you. I put clues in the above paragraph. Luckily, I got an email that said "you can blog about this now if you want to" Ha. IF? If? Oh yes, I want to. I really REALLY want to share it. A second amazing thing happened to me. It all started a few weeks ago. I got a nice email from someone I didn't know. It looked intriguing and I took the chance and read it. I figured if I didn't open attachments or click on links in the email I would be safe. It seems that one of the editors -yes I said EDITORS - from a magazine found my blog and read it. Perhaps "Interweave" rings a tiny bell with you? It did with me. You see there is an art quilting show that I watch on Saturdays - or record and watch later. 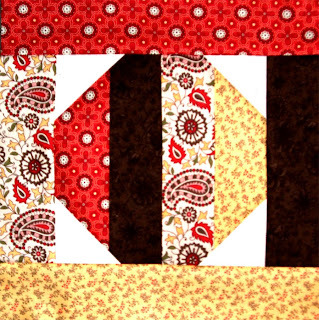 The show features Patricia "Pokey" Bolton and is called "Quilting Arts." The company also publishes a magazine called "Cloth Paper Scissors" --have I gotten your attention now? This group also publishes a magazine that comes out four times a year. It is called Studios. I was asked to send in some photos and answer some questions "for consideration for publication in our magazine." WHAT? ME??? You are kidding right? Surely someone was playing with me. So I did some research and found the editor listed. I checked the email address that the email came from. Everything looked legit. Oops wait a minute - I don't really have a studio, do I? I wrote back and explained that I just use a very small area for my quilting. No problem! Send it in. I did it. Today, I got an email proof of the article so that I could verify that nothing was changed or misquoted. Due to copyrights I can't share that with you. Sorry. The good news is this: I will let you know when the magazine comes out and you can get your very own copy. I may even get an extra and have a giveaway. If I do, I will autograph the giveaway copy for you. Today, life is good for me. I hope good things for you to my blog readers and friends! So you can try to win one too. So get AccuQuilt and Go! Well what are you waiting for? Go on over to Barb's and enter.....really GO! Sorry I am MIA again. I spent the weekend with my Nana and didn't do any sewing or actually much of anything besides visiting and eating. You see she lives at the Gulf Coast in SeaGrove Florida. So I had some wonderful seafood this weekend. By the way, the Gulf Coast of Florida and Alabama are still pristine and lovely. Hopefully the oil leak will be fixed and cleaned up before any oil can mar those lovely coasts. My sympathies go out to those in Louisiana who are dealing with the aftermath of this disaster.